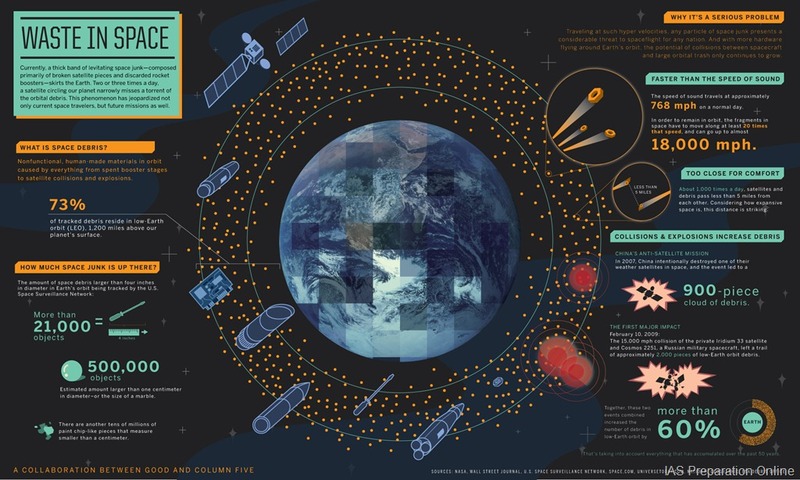 Although outer space is often imagined to be a desolate, empty place, the region around Earth swarms with millions pieces of man-made debris that create potential hazards for their functioning neighbors. Where did all of this junk come from? Will it ever go away? What kind of problems might it create for people stationed on Earth? With the launch of the Soviet satellite Sputnik in 1957, mankind began its journey to reach the stars. But although the first probe in space returned to Earth after only three short months, it kicked off a series of launches that not only inspired people around the world but also filled the region with large chunks of inert metal. For fifty years, the primary source of all of the junk came from objects that exploded by accident. However, in 2007, the intentional destruction of the Chinese weather satellite Fengyun-1C as part of an anti-satellite missile test created a significant field of space debris. Two years later, a defunct Russian military satellite struck an operational American Iridium satellite over northern Siberia, blowing even more trash into space. Despite the small size of most of the objects in space, the U.S. and Russian military are able to keep track of a great deal of the mess. Objects as small as 4 inches (about 10 cm) can be seen by radars or optical telescopes on Earth. When preparing a launch, mission controllers screen the predicted post-launch orbit for potential collisions to avoid as much damage as possible. Similarly, crafts such as the space shuttle and the International Space Station can change their orbits if a larger object approaches. But everything sent into space still faces potential collisions with smaller, untrackable objects that can pit or damage them. Satellites and space craft are heavily shielded to protect vital components. At NASA’s Hypervelocity Impact Technology Facility in Texas, new protective materials can be tested by shooting objects from a Light-Gas gun to simulate space junk collisions. Earth’s orbit is segregated into three distinct regions. Low Earth-orbit (LEO), covers the area 125-1,250 miles (200-2000 km). Pieces of space junk in this region are impacted by the atmosphere, which degrades their orbit, dragging them back to Earth sooner. This is a prime realm for piloted spacecraft due to its easy access. Navigation and communication satellites tend to prefer a semi-synchronous orbit 6,000 to 12,000 miles (10,000 to 20,000 km) above the surface. Satellite telecommunication and weather satellites orbit in geosynchronous Earth orbit, over 22,000 miles (36,000 km) high, and can remain aloft for millions of years. The lower the orbit, the less time the object is likely to remain in space before returning to Earth. Bits and pieces of trash constantly fall from the sky but nearly everything larger than 4 inches (10 cm) survives in some form, likely in smaller fragments. In the last five decades, an average of one piece of debris fell to the Earth each day. Most of the trash raining down burns up in the atmosphere before it ever reaches the surface. Those that survive often fall into water; remember, the ocean makes up approximately 70 percent of the Earth’s surface. According to NASA’s Orbital Debris Program Office, no serious injury or significant property damage from falling debris has been confirmed. In recent years, various space organizations have worked to reduce the amount of trash added to Earth’s orbit by implementing better designs. Russia, China, Japan, France, and the European Space Agency have also issued guidelines on how to cut back on the potential impactors in orbit.